There are many places to visit near Chennai that are popular side trips from the city. The tourist circuit of Chennai, Mammallapuram and Kanchipuram is often referred to as Tamil Nadu's Golden Triangle. These destinations can also be individually visited as day trips from Chennai. If you'd like to get close to nature, consider Vedantangal Bird Sanctuary or Madras Crocodile Bank. Further afield, Pondicherry attracts a lot of visitors from Chennai and can be covered on a long day trip. It's really worth staying there though, as it's a relaxing place to spend some time. Mammallapuram (or Mahabalipuram as it's otherwise known) has a thriving backpacker scene. 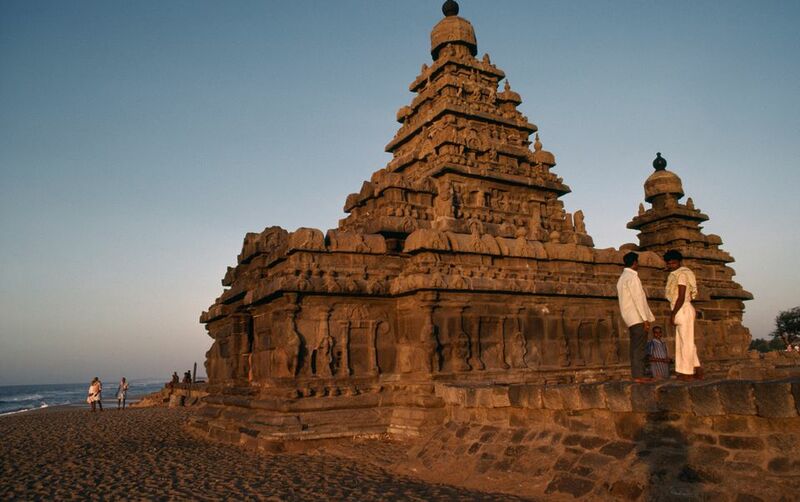 Famous attractions include the windswept Shore Temple on the water’s edge, Five Rathas (sculptured temples in the shape of chariots), and Arjuna's Penance (a huge carving on the face of a rock depicting scenes from the Mahabharatha). Mammallapuram is known for its surfing and stone sculpture industry as well. The annual Mamallapuram Dance Festival is held during late December to late January at Arjuna's Penance. Plan your trip there with this Mammallapuram beach travel guide. Location: About a hour an a half south of Chennai, along the East Coast Road. Looking for sand and surf? You don't need to go as far as Mammallapuram. The fishing village of Kovalam (also called Covelong) has one of the best surf schools in India, Covelong Point Social Surf School. The school's fantastic new surf facility opened in mid 2015, with a cafe, lounge and guest rooms right on the beach. Part of the earnings go towards funding social projects in the village. A Surf, Music and Yoga Festival is held every September, and free surfing lessons are offered as part of it. The Taj hotel group also has a luxury resort, the Fisherman's Cove, in the area. Location: About an hour south of Chennai, on the East Coast Road. If you're heading down the East Coast Road, do spend some time at Dakshina Chitra, on the way to Kovalam and Mammallapuram. One of the top museums in India that showcase the country's culture, it features a collection of 18 authentic historical houses from all over south India. Each one has been transported and reconstructed on the premises, and contains an exhibition related to the lifestyle of the community that it belonged to. The museum is a project of the Madras Craft Foundation. It opened in December 1996. Crafts are promoted via activities and workshops for visitors, and there's also has a handicrafts shop on the premises. Location: Muttukadu, about 50 minutes south of Chennai on the East Coast Road. Next to MGM Dizzee World. Opening Hours: 10 a.m. to 6 p.m. Closed Tuesdays and Diwali. Tickets: 100 rupees for Indians. 250 rupees for foreigners. Discounts are offered for students. For a close encounter of the reptilian kind, don't miss Madras Crocodile Bank where you'll be able to meet more than 35 species of reptiles and amphibians. This includes 17 species of crocodiles (numbering 1,800 of these snappy creatures) as well lizards (including komodo dragons), snakes and turtles. Although it's one of the largest reptile zoos in the world, there is a much broader focus on conservation and education. Activities include guided tours, reptile feeding, and night safaris (when the crocodiles really come to life!). The most infamous crocodile, the massive and savage Jaws III, is publicly fed every Sunday at 4.30 p.m. You can also join the volunteer program. Location: Between Kovalam and Mammallapuram on the East Coast Road, south of Chennai. Opening Hours: 9 a.m. to 5.30 p.m, and 7 p.m. to 8.30 p.m. (for the night safari). Closed Mondays. Tickets: Entry tickets are 60 rupees adults and 30 rupees for kids below 10 years of age. Night safari tickets are 200 rupees for adults and 100 rupees for kids. Experience "Life on the Udder Side", at The Farm! This property started as a dairy farm 1974, and has grown into a rustic rural tourism destination. The owners opened a restaurant and store there in 2009, where they serve and sell their organic produce. This includes cheese, butter, ghee, pickles, jams, rice, oils, and breads. The restaurant's wood-fired ovens are a highlight, and they churn out delicious pizzas. Those who want to learn about farming can go on a guided walk through the stables (kids can feed the animals) and vegetable gardens. Book ahead on weekends, as it gets busy. Location: 1/277 Semancheri Village, Old Mahabalipuram Road. It's about an hour south of Chennai. Pondicherry, a separate union territory on the east cost of Tamil Nadu, has a French feel and a beach vibe. This former 18th century French colony is home to Sri Aurobindo Ashram, which attracts plenty of spiritual seekers. Sri Aurobindo's teachings were based on the concept of integral yoga and surrendering to a higher consciousness. Nearby, Auroville is a experiential spiritual community set up with the objective of human unity. It was founded in 1968 by a French woman called "The Mother", who was the successor of Sri Aurobindo. Stay at one of these 12 Pondicherry hotels in near the beach for all budgets. Location: Three and a half hours south of Chennai, along the East Coast Road. Labeled as the "City of a Thousand Temples", Kanchipuram is not just famous for its distinctive silk saris. It was once the capital of the Pallava dynasty, which ruled widely in south India from the 2nd to 9th centuries. Today, only a 100 or so temples remain, many of them with unique architectural beauty. The diversity of temples is particularly noteworthy. There are both Shiva and Vishnu temples, built by various rulers (the Cholas, Vijayanagar kings, Muslims and British also ruled this part of Tamil Nadu) who each refined the design. In case you want to shop, here are some tips for buying Kanchipuram saris. Location: Two hours southwest of Chennai, on the main road to Bangalore. If you're into nature, Vedantangal Bird Sanctuary is a good place to go bird watching at the right time of year. A diverse variety of migratory birds come to nest in the open mangrove habitat from November to March. For the best sightings, go early morning or late afternoon at the height of breeding season, in December and January. Bring binoculars and your zoom lenses! Binoculars can also be hired. Nearby, the lesser known Karikili Bird Sanctuary is worth visiting too. Location: About two hours south of Chennai, along National Highway 32. Opening Hours: 6 a.m. until 6 p.m.
Tickets: 25 rupees for adults, 5 rupees for children. This is one of the rare places in India where the price is the same for Indians and foreigners. There are not many forts remaining in Tamil Nadu but Gingee Fort is one of them. It occupies three hills (and requires an energetic climb), on the way to Tiruvannamalai from Chennai. This remote and highly impenetrable fortress was apparently referred to as "Troy of the East" by the British. It's in ruins now but still has many interesting structures, including temples, prison cells, marriage hall, and sacred pond. Location: About three hours southwest of Chennai, along National Highway 32. Instead of going south, head north of Chennai to the historic seaside port town of Pulicat (also known by its Tamil name of Pazhaverkadu). This off-beat tourist destination is part of what's known as Dutch India. Except for a short break, the Dutch ruled Pulicat for 214 years, from 1606 to 1825 when it was relinquished to the British. However, Pulicat's heritage dates as far back as the 3rd century BC, to the ancient Chola dynasty. The town's monuments include a Dutch Cemetery, temples, churches and mosques. In addition, Pulicat has the second largest brackish water lake in India, after Chilika Lake in Odisha. The Pulicat Lake Bird Sanctuary attracts some rare birds, including flamingos. Location: An hour and a half north of Chennai, along State Highway 104.